The MP collective yesterday voted against all the Brexit options presented to them – again. Even the much-favoured "customs union" option failed to get a majority, albeit narrowly, gaining 273 votes as against 276 again. With a -3 score, however, that puts it in pole position. Coming second with 280 votes for and 292 against was the "confirmatory public vote", giving it a vote of -12. With a score of -21, after 261 votes for and 282 against, Common Market 2.0 came third, while "parliamentary supremacy" dipped into triple figures with a score of -101, with 191 votes for and 292 against, coming a poor fourth. Nick Boles, one of the main promoters of CM2, resigned the Tory whip moments after the result. He was disappointed, he said, at his party colleagues' unwillingness to compromise. For all the faux drama of the vote, it is easy not to get worked up about it as it was a completely pointless exercise, demonstrating once again the irrelevance of parliament to the solution of the Brexit process. At this stage though, with ten days to go before the likely outcome of a no-deal Brexit, we should note that not a small part of the Westminster problem is the overweening ignorance of politicians of the basics of the European Union, essentially disqualifying them and their institution from making a useful contribution. We've known about this ignorance for some long time, with Christopher Booker alluding to it in his final column last Sunday. It is most often shared by the media but, worse still, excused by fawning political journalists who should know better. Thus yesterday, hours before the vote, we had the Guardian's Jennifer Rankin attempt to write an article on customs unions, eliding this very specific form of trade agreement with trade policy in general and "trade deals", without any attempt to define the nature of a customs union. Reflecting the general confusion of her piece, she noted that a proposal for a permanent customs union with the EU fell just six votes short of a majority last week, when MPs voted on their preferred Brexit outcome, going on to write: "For years a niche subject for campaigners, wonks and eurosceptics, trade policy has become a big issue in British political life". Only then does she come up with the killer line: "One former prime minister told a private audience recently that if he had been asked about the EU customs union during his time in office, he would not have known what they were talking about", thereby illustrating in spades the poverty of knowledge within our political classes. Since 1972, when we joined the EEC, a customs union has been an integral part of our system of government, forming the core policy of the Community. It is simply not acceptable for any Westminster politician, much less ministers and the prime minister, not to know the basics of our system of government, and how it works. But even now we have an apologist who excuses the ignorance of politicians because they are "forced to be generalists and not experts". It's unreasonable, we are told, to expect them to have the level of knowledge that I have, and not to make mistakes. Interestingly, I concluded my formal education before the UK joined the EEC and most of what I have learned of the EU and its predecessors has been self-taught – and at some considerable cost to myself. But, apparently, while I am free to spend my time and wealth in the acquisition of knowledge, it is not reasonable for me to criticise MPs - paid-for out of the public purse – when they fail even to master the basics of how our system of government works. These are the same MPs who, as I was writing this piece, were deciding the future of our relationship with the EU and who in the normal process of their work, feel free to pass laws which impact on my personal life, and impinge on matters of vital interest to me and those whom I hold dear. But, if they feel they are entitled to uphold their blissful state of ignorance, they are also entitled to my unreserved contempt. 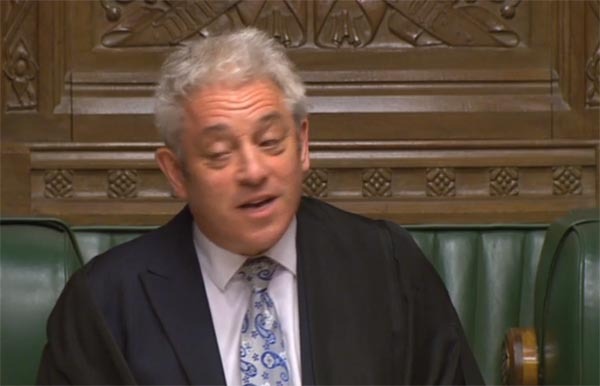 And it is in that frame that I approached yesterday's ludicrous proceedings in the Commons, where the speaker had selected four of the eight motions tabled and these were put to the vote. Top of the list was Kenneth Clarke's "permanent and comprehensive UK-wide customs union with the EU", a choice so crass that it beggars description. Apart from the probability that a goodly number of MPs thought that it meant customs cooperation, and hadn't the wits to understand the difference, this was an option that could contribute nothing to the UK's post-Brexit needs. It could only claw us back to the relationship we had in 1973 when we first joined the EEC and ignores completely the emergence of the Single Market. Nevertheless, it was offered by its author as a compromise solution, something "better than nothing" in an attempt to break the impasse. That this came within three votes of being adopted says so much about the MP collective if, after nearly three years of the Brexit process, this is the best they can manage. But then the next option - in order of nearly not failing - was of no value either. Not in any sense could a "confirmatory public vote" represent a "way forward" which Mrs May could take to Brussels as the basis of her pitch for extra time. With parliament having failed three times to ratify the Withdrawal Agreement, this is effectively an attempt to re-write the UK's constitution, having a treaty approved through the mechanism of a referendum. Then, with Common Market 2.0 (CM2) coming third, we now see the Kinnock/Boles butchery of the Efta/EEA option hit the buffers. Although it was potentially a good scheme, it had been fatally marred by inclusion of an entirely unnecessary customs union, by being oversold as a quick-fix and by its authors ignoring the need for multiple bilateral treaties (or even new protocols) to augment the basic EEA Agreement. This is what happened when the amateurs took over the Efta/EEA option and started messing with things they didn't understand. They created such a mess that even staunch advocates of the option could not support them. But then, in his own words, Boles was "not an expert in the fine detail of customs arrangements and regulatory equivalence", and professed that he would rather chew off his own arm than become one. And yet, he felt equipped to produce his plan without referring to the authors of the most comprehensive version of the Efta/EEA option. Remarkably, from the point of view of more sensible options, the speaker had not chosen the less-flawed Efta/EEA option produced by George Eustice. This illustrated to perfection how Westminster "bubble" politics has departed from reality. CM2 gained Labour support but even then Corbyn made it clear that Labour was not backing the plan because it agreed with every aspect of it. Aspects, he wrote in a letter to his MPs, overlapped with the Labour concoction. By backing it, he wanted to "break the deadlock", to find that fabulous creature called "consensus", repeating the ploy rolled out by Kenneth Clarke. Had it succeeded, we would have been left with an unworkable scheme, akin to Orville and Wilbur Wright deciding to abandon designs for the Flyer in order to seek a compromise that found more favour with their contemporaries. If they had worked on that basis, we'd still be crossing the Atlantic in ships. In any event, the elusive consensus broke down. The prospect of not ending freedom of movement led 25 Labour MPs to defy their whip, even though the option provides by far the best mechanism for controlling it. Another 33 Labour MPs abstained, matched by the number of Tory MPs who supported it. And that brings us to the final failed motion, the one labelled "parliamentary supremacy". It would appear that, by a margin of 101 votes, parliament did not want to be "supreme", even though this would have created the situation where, in the event of the Withdrawal Agreement not being ratified by the time we were about to leave, the government would be called upon to seek an extension to the Brexit process. In the event that this not being forthcoming, the government would have been required to ask parliament whether it wanted a no-deal or to revoke the Article 50 notification, giving parliament – in theory – ultimate control over the Brexit process. It says something of this motion that the surest way of gaining an extension would have been for parliament to have ratified the Withdrawal Agreement, something it may yet get another chance to do. This time it may be coupled with a motion offering MPs a greater part in the next stage of the Brexit talks – thereby circumventing the speaker's ban. Predictably, the media are also suggesting that Mrs May could link this with a threat to engineer a general election, leading to the certain immolation of the Conservative Party. Even that, however, may not be enough to shock Mrs May's troops into line, while parliament has so lost the plot that it seems impossible to predict how it will react. At least it has not voted in favour of a zeppelin-scale inflatable giraffe, but that could be because it has not yet been given the opportunity. Perhaps if Mrs May told them to vote for the WA or the giraffe gets it, that could make the difference. Certainly, after Brexit, it'll have difficulty crossing borders.